Downing and Tipton are breakin' the law...and answering your questions! As you no doubt know, MusicRadar is getting ready to crank it way past 11 with what will be the loudest seven days ever: Metal Week. And who better to interview than two axe men who have helped raise fists and devil's horns the world over? 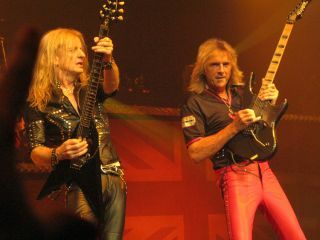 That's right - Judas Priest's Glenn Tipton and KK Downing. The mighty Priest are celebrating the 30th anniversary of British Steel, their breakthrough album that included classic cuts such as Breaking The Law, Metal Gods and the stadium anthem Living After Midnight. On 11 May, Sony/Legacy will commemorate this most influential recording with not one but two British Steel reissue packages.